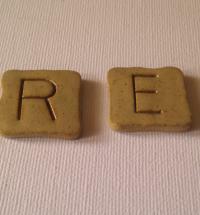 Handmade individual ceramic alphabet square tile. Each tile is unique, painted and kiln fired therefore they will differ slightly in size and colour. Please note that these are often made to order so it could take up to 2 weeks for to be made - you can contact us to make an enquiry if you would like these by an earlier date, just click on the 'contact us' button at the top of the page.